THE MOST POPULAR WIRELESS WIFI PROJECTOR ON AMAZON: After deep research on the market, we noticed lots of our customers would like to deliver the smartphone screen to projector for a big display view experience. Today, Jinhoo WIFI Projector has perfectly solved the screen mirroring issues now. By using our WIFI projector, you don't need to order the variety of adapters anymore! HOW TO PROJECT Smartphone TO BIG DISPLAY? ① You can set up the WIFI settings in the projector and connect your smartphone with our projector directly. ② You can also use the original USB cable to connect your Smartphone to our projector directly. All in all, easy operation! WHAT ABOUT FOR ANDROID DEVICE? 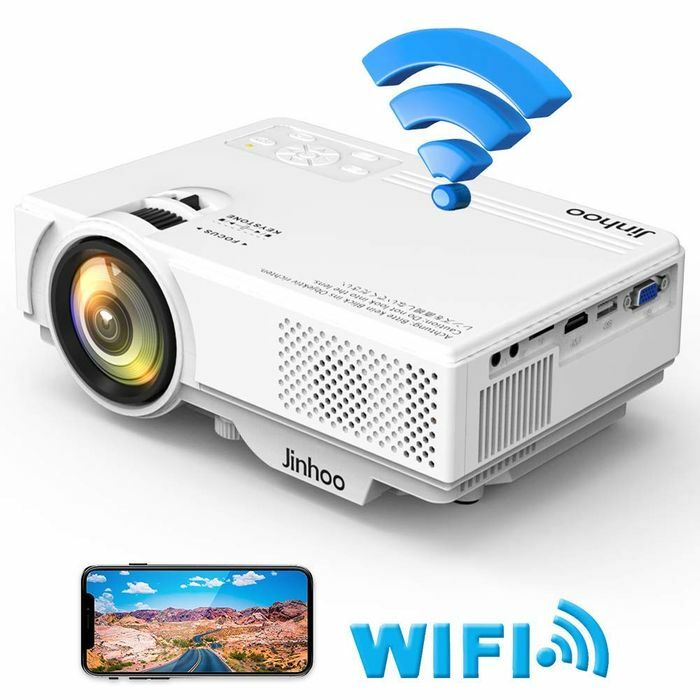 Although different Android devices vary, you can still use our Jinhoo WIFI projector to project your mobile screen to big display if your phone supports the Multi-media or Project Screen function. How wonderful it is! WHAT ELSE YOU MUST KNOW? Jinhoo Wireless projector native resolution is 800*480, and it can support the highest resolution of 1920*1080. The aspect ratio is 16:9/4:3, with 2000:1 contrast ratio. The lamp life is up to 50,000 hours. The display size is 32"- 176" at the distance of 1.2M-5M. 3 YEAR WARRANTY: Jinhoo provides a 3-YEAR WARRANTY promise, you can contact us anytime and we will offer goods exchange and money refund with no reasons in the warranty time. You can contact us at e-mail, call and our Brand Website and will be answered within 24 hours.